It is the longest transit of the century, with more than seven and a half hours long. Only in 2095 there will be another almost as long. The smallest of the eight planets in the Solar System will pass in front of the sun and will be the focus of attention for professional and enthusiast of astronomy, but of course anyone can look at it under two conditions. First, protect your eyes with filters as indicated because look directly to the Sun causes blindness. Secondly, having an optical aid such as binoculars (adapted filter) or a telescope with the same hardware. Mercury occupies only 1/160 of the surface of the star, it is impossible to distinguish in transit without a help, but who can see will appreciate a small well-defined point, unlike dark sunspots but also irregularly and often with a size many times the Earth even. Every four months or so, this small planet, where there are currently orbiting spacecraft passes in front of the Sun but given the relationship of the orbit with respect to Earth, only slightly more than a dozen times coincide for it can be seen from here. Given the orbits, we can have transits only in May or November. For earthlings there are only two transits, Mercury and Venus, because other planets are farther from the sun than Earth. The transit of Venus is more spectacular, being higher that planet itself can be distinguished only by protecting the eyes, but unlike tomorrow transits of Venus occur only in close pairs each more than 100 years: we had in 2006 and 2012 next pair is on 2117 and 2125. This Monday is the transit of Mercury longest of the century, with more than seven and a half hours long. Only in 2095 there will be another almost as long. 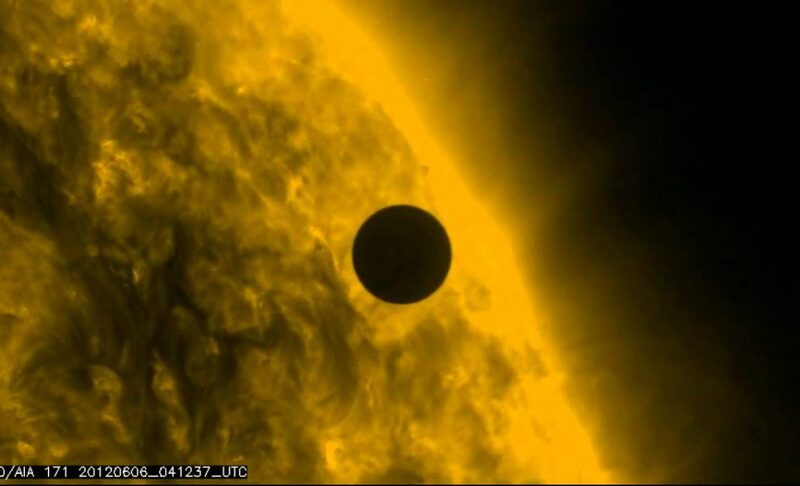 The initial ‘bite’ of the planet on the solar disk will occur at 06:12 (GMT-5) and the total output will occur at 13:39 (GMT-5). Around 09:37 (GMT-5) or so will be at the halfway mark. It will last as long despite the planet being not slow. In fact it moves about 48 kilometers per second, but we must remember that our star has a diameter of 1,341,400 kilometers and although the traffic will not be for the entire half. It is about 109 times larger even than the Earth itself, which nevertheless offer a special show if someone was on Mars, because from there if you can see the passage of the planet across the Sun, which happens every 26, 79 and 100 years with additional one every 1,000 years. The diameter of the smallest of the planets is only 4,879 kilometers. Each transit is used by scientists to make different calculations and analysis. Thus in 1631 it allowed astronomers to measure the apparent size of the disk of Mercury and calculate the distance from the Sun to Earth. Three solar telescopes of NASA will be used to calibrate equipment by viewing this extraordinary phenomenon. The Soho telescope will measure the solar rotation axis and the oscillations in the star. More details of how it changes the hours, days, years and decades will be taken. But also it watches what happens on Mercury. In the transits of 2003 and 2006 could be detected, for example, the planet’s surface free sodium atoms. On land and in space, numerous telescopes directed its gaze to the phenomenon that seems inconsequential but it is not. The next transits of Mercury will occur on November 11, 2019 and there will have to wait until November 13, 2032. The morning will be observed in America, Africa and most of Asia, but throughout its duration will only be possible in most of South America and half of North America’s East.